In my last post I described how to (really) deploy CRT/MFC DLLs into the same directory as the application (xcopy deployment). “Really” means, that it will never load any DLLs installed in the WinSxS directory. This is archived by removing the “publicKeyToken” from the manifest. If you leave the “publicKeyToken” inside the manifest, then it will force loading of (possibly) installed WinSxS versions (and updates/redirections). Visual C++ Libraries DLL Deployment. One of the main reasons for this is the new focus from Mircosoft to Security. The main disadvantage of really AppLocal installations is, that Microsoft is not able to update or patch your installation (or better the CRT/MFC components of your installation). And this sees to be anathema to Microsoft. The same is also true for static linked applications. This entry was posted in WinAPI on 2008/05/05 by jkalmbach. There are several reasons for xcopy deployment of an application (also known as application local). One main reason is that you are independent of what the target computer has installed. Also your application always uses the “correct” (or better: tested) version of DLLs, regardless of what MS installed or updated (see: .NET2 SP1 update breaks old apps!?). The easiest way to overcome the problem is to link static against the CRT/MFC. But in some scenarios this is not an option and not possible. Open the manifest-file (appname.exe.manifest) and remove the “publicKeyToken” from all MFC/CRT/ATL/OpenMP entries. Please leave the publicKeyToken to the “Microsoft.Windows.Common-Controls” entry. After doing all these manifest stuff you can also embed the manifest into your application (EXE). And of course: The same can be done with x64 and IA64 apps. I have made an example of the default MFC app (4.6 MB) for reference. Instead of putting the “Microsoft.VC90.MFC” and “Microsoft.VC90.CRT” directories into the application folder, you can also just put the files from these folders into the application directory. The main advantage is, that your app will also work on W2k-SP4. Here is also my older post for VS2005. This entry was posted in WinAPI on 2008/05/03 by jkalmbach. This entry was posted in WinAPI on 2008/04/30 by jkalmbach. The feature Pack for VC++ 2008 is now available for download. You can download the feature Pack for the englisch version only (ENU)! Also one note: If you want to use the new Ribbon UI (Office 2007 UI, also known as Fluent UI), you must agree to the Office 2007 license! This entry was posted in WinAPI on 2008/04/07 by jkalmbach. Just upgrade to VS2008! Even without an existing license! That looks interesting! So, download the express edition, then you can buy the upgrade version of VS2008! This entry was posted in WinAPI on 2008/04/04 by jkalmbach. 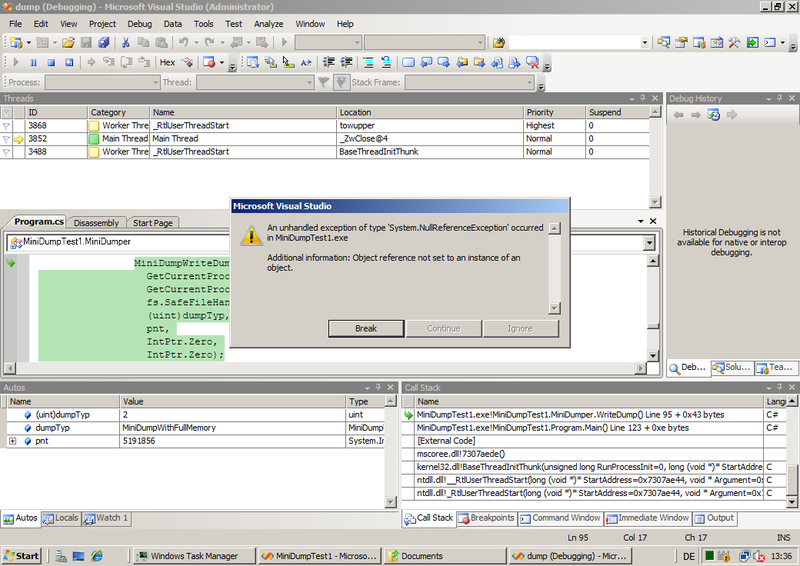 Starting with VC8 (VS2005) it is not possible to catch all unhandled exceptions with your installed exception-filter (via SetUnhandledExceptionFilter). In some situations, the CRT forces the call of WER (Windows Error Reporting). One situation (/GS buffer overruns) can never be catched in your filter. If you want to catch all exception inside your filter, you need to intercept calls to SetUnhandledExceptionFilter to prevent the removing of all previous installed filters. #error "This code works only for x86 and x64!" // JMP rel32: Jump near, relative, displacement relative to next instruction. // Thanks to Matthew Smith!!! This entry was posted in WinAPI on 2008/04/02 by jkalmbach. Today I did a screencast on how to use the application compatibility layer (and especially the APILogger shim) to do API logging. This is a very interesting screencast if you want to log and display API calls of other programs in a very nice and simple way. This entry was posted in WinAPI on 2008/03/06 by jkalmbach. Here is a short screencast which shows how to adjust the project settings to link against the static C-runtime (CRT). This prevents that you must ship the CRT-DLLs with your application. Your application just works after copying the exe to the target computer. This entry was posted in WinAPI on 2008/03/03 by jkalmbach. This works very well under XP (but only if you are an admin). It does not work under Vista if UAC is enabled (even if you are admin). It only works if the process was started evelated (as real admin)! So there must be a better way to read the reparse data. First I tried to find an other function to get the data. But this had no success… then I remembered my research about “Shims” which are part of XP and later. These shims can be used to “fix” application compatibilities in news OSs. To activate a shim for an appliction you can use the “Application Compatibility Toolkit” from Microsoft. And also I remembered an Shim namaned “APILogger”. Ok, then I copied “cmd.exe” to a temp-dir and renamned it; created and installed the sdb-File with the APILogger for this new “testcmd.exe”; and executed the “dir c:\ /AL” command. Afterwards I could easily find the correct approach to get the reparse data (in a later blogpost I will explain how to use the APILogger-shim). The key point is: You must open the directory only with “FILE_READ_EA” access! ADD (2008-03-07): Thanks to the comment of Sergey, I now changed the sample code to correctly display JUNCTIONs (mount points) and SYMLINKD (symbolic-links). It seems that the documentation of REPARSE_DATA_BUFFER is incorrect, because the missed a field named “Flags”. I changed the structure to the correct definition which can be found in the DDK header file “ntifs.h”. This entry was posted in WinAPI on 2008/02/28 by jkalmbach. This entry was posted in WinAPI on 2008/02/26 by jkalmbach. Starting with Vista, MS introduced the new Windows Error Reporting API (WER) and removed Dr. Watson from the system. The WER-System now directly sends by default the data to WinQual. They also changed the behaviour, that a minidump is only generated if the WinQual-Server requests this. So by default there is no way to get to a local minidump if you are not registered at WinQual (which costs 400$/year). This entry was posted in WinAPI on 2008/02/07 by jkalmbach. Then you get an EXE file with 2048 Bytes. Then you get an EXE file with 688 Bytes (VS2008) / 768 Bytes (VS2010). So the question is: why does the CRT need so much space? Most of the space is needed for “security reasons”. That is also the reason why I needed the specify the “/GS-” compiler switch to reduce the exe size. If you enable the buffer security checks, it triggers the compiler to use several functions and structures, which must be provided by the CRT. And if you use the CRT, it also provides the default entry point and initializes all kind of stuff like calling constructors of static/global classes and others. These are the main reasons why the CRT uses so much memory. Another think is: if you want to use floating-point values, you also need the CRT. The reason is not very obvious for me… but the compiler is triggering the symbol “_fltused” to be linked with the image. If you provide your own “implementation” of this variable, it seems to work; but I don’t understand why the compiler is needing this variable. This variable must be set to a “magic” value (0x9875); I don’t know where this value comse from (expect it is defined in the CRT sources). This entry was posted in WinAPI on 2008/02/02 by jkalmbach.